A cricket bat is a specialised piece of equipment used by batsmen in the sport of cricket to hit the ball, typically consisting of a cane handle attached to a flat-fronted willow-wood blade. The length of the bat may be no more than 38 inches (965 mm) and the width no more than 4.25 inches (108 mm). Its use is first mentioned in 1624. Since 1979, a rule change stipulated that bats can only be made from wood. The blade of a cricket bat is a wooden block that is generally flat on the striking face and with a ridge on the reverse (back) which concentrates wood in the middle where the ball is generally hit. The bat is traditionally made from willow wood, specifically from a variety of white willow called cricket bat willow (Salix alba var. caerulea), treated with raw (unboiled) linseed oil, which has a protective function. This variety of willow is used as it is very tough and shock-resistant, not being significantly dented nor splintering on the impact of a cricket ball at high speed, while also being light in weight. The face of the bat is often covered with a protective film by the user. The blade is connected to a long cylindrical cane handle, similar to that of a mid-20th-century tennis racquet, by means of a splice. The handle is usually covered with a rubber grip. Bats incorporate a wooden spring design where the handle meets the blade. The current design of a cane handle spliced into a willow blade through a tapered splice was the invention in the 1880s of Charles Richardson, a pupil of Brunel and the first Chief Engineer of the Severn Railway Tunnel. Spliced handles had been used before this but tended to break at the corner of the join. The taper provides a more gradual transfer of load from the bat's blade to the handle and avoids this problem. The edges of the blade closest to the handle are known as the shoulders of the bat, and the bottom of the blade is known as the toe of the bat. Bats were not always this shape. Before the 18th century bats tended to be shaped similarly to a modern hockey sticks. This may well have been a legacy of the game's reputed origins. Although the first forms of cricket are obscure, it may be that the game was first played using shepherd's crooks. The bat generally recognised as the oldest bat still in existence is dated 1729 and is on display in the Sandham Room at The Oval in London. When first purchased, most bats are not ready for immediate use and require knocking-in to allow the soft fibres to strike a hard new cricket ball without causing damage to the bat, and allowing full power to be transferred to the shot. Knocking-in involves striking the surface with an old cricket ball or a special mallet. This compacts the soft fibres within the bat and reduces the risk of the bat snapping. The bat may also need raw linseed oil, which fills in the gaps between the fibres. Law 5 of the Laws of Cricket state that the length of the bat may be no more than 38 in (965 mm), the width no more than 4.25 in (108 mm), the overall depth no more than 2.64 in (67 mm) and edge no more than 1.56 in (40 mm). Bats typically weigh from 2 lb 7 oz to 3 lb (1.2 to 1.4 kg) though there is no standard. Appendix B of the Laws of Cricket set out more precise specifications. This rule was introduced following the Monster Bat Incident of 1771. The 2017 update to the Laws saw no changes to the maximum length of the bat, which is still 38 inches/96.52 cm, but a new specification stated that the edge of the bat cannot be more than 1.56 inches / 4cm while the depth cannot be more than 2.64 inches / 6.7cm. The umpires are now given a bat gauge so they can check the legality of the bat at any time. Bats are available in a range of sizes, with some manufacturers offering unique variations. Commonly found are children's sizes 0 to 6, youth size Harrow and adult sizes. SH (Short Handle) is the most common adult size, whilst long handle and long blade options are also available. Children's sizes increase in length and width as the size increase. Although most adult bats will be the maximum width permitted (4.25 inches), no generally available cricket bat is the maximum length of 38 inches, indeed very few exceed 35 inches. The oldest surviving bat dates from 1729. Note its shape, which is very different from modern-day bats. Various companies have over the years tried new shapes that come within the laws of the game to make a name for themselves and to improve sales. In the 1960s the first shoulderless bats appeared from Slazenger. This allowed more of the weight to be redistributed to the "sweet spot" of the blade providing more power to each stroke, whilst still having good balance and light "pick up." This style of bat was made famous by Lance Cairns's six sixes in a match played in 1983. The 1970s saw double-sided bats from Warsop Stebbing. With the advent of Twenty-Twenty cricket, double-sided bats are experiencing renewed interest. In 1974 the first GN100 Scoop was released; this was the first bat to turn shaping on its head by removing the wood from the centre of the rear of the bat. By removing this wood, the bat became lighter, its sweet spot grew and its pick up improved. Even though there is less material, strong strokes are still possible if well-timed. It allows weaker players to play many strokes they would otherwise omit from their repertoire. This bat quickly became a big seller and various scooped bats such as the GN500, Dynadrive and Viper have been released by Gray Nicolls ever since, including a re-release of the Scoop itself for the 2012 English season. The removal of wood from the rear has been copied by many other companies without much critical acclaim. In 1979 Australian cricketer Dennis Lillee briefly used a ComBat aluminium metal bat. After some discussion with the umpires, and after complaints by the English team that it was damaging the ball, which was later proved untrue, he was urged by the Australian captain Greg Chappell to revert to a wooden bat. The rules of cricket were shortly thereafter amended, stating that the blade of a bat must be made entirely of wood. In 2005 Kookaburra released a new type of bat that had a Carbon fibre-reinforced polymer support down the spine of the bat. It was put on the bat to provide more support to the spine and blade of the bat, thus prolonging the life of the bat. The first player to use this new bat in international cricket was Australian Ricky Ponting. Kookaburra withdrew it after advice was received by the ICC from MCC that it was illegal under Law six. In 2005 Newbery created a carbon fibre handle, the C6 and C6+, which weighed 3 ounces/85 grams less than a standard laminated cane and rubber handle. It was used by Newbery and Puma for 3 years before the concept was copied by Gray Nicolls with a hollow plastic tube. However, this provoked the MCC to change the law on materials in handles amid fears that the new technology would lead to an increase in the distance the ball was hit. Now only 10% of the volume of the handle can be other than cane. Also in late 2008, SAFBats created a cricket bat with an offset edge, the edge offsetting allowed for an extended middle, better swing weight and increased performance without compromising the cricket bat's balance. The production models were available in 2009, and the bat won awards in 2010 and 2012. In 2004 Newbery created the Uzi, with a truncated blade and elongated handle for the new Twenty20 format of the game. This change allowed more wood to be placed in the middle, as more attacking shots are played in the shorter version of the game. In 2009 an extreme version of the Newbery Uzi shape named the Mi3 was launched by Mongoose. The design is unusual in that the blade is 33% shorter than a conventional bat and the handle is 43% longer. Launched with a fanfare of publicity it proclaimed the idea of not defending the ball in the T20 format and purely playing attacking shots. On 11 March 2010, Mongoose launched its range in India with the announcement of Matthew Hayden as the brand ambassador. Stuart Law, the former Australian Test player, called it "a half-brick on a stick". The bat was used by Anuraag in the 2010 version of the IPL. Gareth Andrew, the Worcestershire all-rounder, scored the maiden 100 with an MMi3 in professional cricket, when he hit 100 off 58 balls at the Oval in 2010 against Surrey. In 2008 Lekka Cricket launched a T20 format bat, the Big Hitter. Black Cat Cricket then launched a T20 format bat, the Joker, in 2009. These worked on a similar principle to other T20 bats with the blade length reduced by one inch and an inch longer handle, but uniquely reduced the width of the bat to 4 inches in an adult bat. 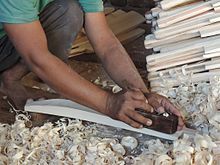 Modern bats are usually hand made in Sialkot, Pakistan and India due to the low cost of labour. However a few specialists in England, Australia, and New Zealand still make bats, mostly with use of a CNC lathe. Before first being played, a bat should be "knocked in". Knocking a bat in compresses the surface wood fibres and allows it to be ready for use, as most brand-new bats will crack or badly dent if used in competition without being knocked-in. This is usually done after purchase, although some are sold ready-knocked. The process begins with the application of a layer of linseed oil to the surface of the bat, after which a worn-down 'soft' leather cricket ball or a specialised mallet may be used to repeatedly hit the face of the bat. After three to four hours of knocking in, another layer of linseed oil may be applied. At this stage, the bat may be used in light practice but should not be used in competition without another few hours of knocking-in. The splice of the bat should not be knocked as this will cause the bat to "jar". After being properly knocked in, the wood will make a slightly higher-pitched sound when hitting the ball and will feel softer to use. During the knocking-in process, a fingernail is pressed into the front face of the bat to check if the bat is properly knocked in. If an indentation is left on the bat during this process, it shows that the wood is still not fully compressed, and should be knocked in for longer. Many large sports stores and specialised cricket stores use special machines to knock in the bats for customers. Some manufacturers will roll the bats through a special press to compress the wood, however many bat manufacturers choose not to do this as the spring may be rolled as well, causing jarring. Many bats that claim to be pre-knocked-in by the manufacturer should be manually knocked in anyway as this claim is not a guarantee that the bat is ready to be used in competition. A traditional wooden bat has its surface oiled with raw linseed oil before play, and regularly during the season. This has a protective effect on the wood, and also makes it less sensitive to humidity changes in the atmosphere, which could cause warping or splitting. Another important factor is that it increases the surface friction of the ball to bat surface, giving better control of the shot. A worn surface can be noticed by the player, indicating that re-oiling is needed. Raw linseed oil is used, rather than boiled linseed oil, as the raw form is not a drying oil to the same degree, and so the surface remains tacky. Some bats are plastic-coated or other otherwise sealed on the surface and either cannot be oiled, or do not require oiling until this coating begins to wear off. Traditional Indian cricket bats are made in the regions of Jammu and Kashmir, Punjab, Haryana, Gujarat, Uttar Pradesh and Rajasthan. In Kashmir they are made out of willow found in northern India. Some bats made in Kashmir are of international standards and are/were used by national players in India Sunil Gavaskar, Virender Sehwag and Yuvraj Singh. The willow used in making these bats was brought in by the British, who ruled India, during the 1820s. The industry, established in Kashmir, combines traditional tools with modern technology. Kashmiri bats require constant knocking and oiling to make the bat good enough to use in a cricket match. Knocking makes the fibres of the willow blade compress together, which helps the bat bear the impact of the ball. Another major aspect of taking care of such bats is oiling. Oil is applied on the back, toe, front and edges of the bat to make it more durable and to ensure the fibres get knitted properly. Some of the districts where these bats are made in Kashmir are Anantnag, Baramula, and Pahalgam. ^ "Severn Tunnel (1)". Track Topics, A GWR Book of Railway Engineering. Great Western Railway. 1971 . p. 179. ^ Jones, Stephen K. (2009). Brunel in South Wales. III: Links with Leviathans. Stroud: The History Press. p. 56. ISBN 9780752449128. ^ Warner, PF (1912). Imperial Cricket. The London and Counties Press Association Ltd.
^ "Cricket equipment: Caring for your kit". BBC Sport. 26 August 2005. Retrieved 14 November 2010. ^ a b Lords.org – Marylebone Cricket Club (1 October 2017). "Law 5: Bats". Lords.org. Retrieved 1 October 2017. ^ Lords.org – Marylebone Cricket Club. "Appendix B – The bat". Lords.org. Retrieved 1 October 2017. ^ "Big bats dismissed, player send-offs introduced in new cricket laws". ABC News. 7 March 2017. Retrieved 25 February 2019. ^ Brett, Oliver (11 April 2005). "Bat maker defends graphite innovation". BBC Sport. Retrieved 14 November 2010. ^ "ICC and Kookaburra Agree to Withdrawal of Carbon Bat". NetComposites. 19 February 2006. Retrieved 2 October 2018. ^ "Handmade Cricket Bats – Handcrafted from English willow by SAFBats". Batscricket.com. Archived from the original on 7 August 2013. Retrieved 26 October 2013. ^ "Handmade Cricket Bats – Handcrafted from English willow by SAFBats". Safbats.co.uk. Retrieved 26 October 2013. ^ "Cricket gets to grip with a new bat". BBC News. 22 May 2009. Retrieved 17 September 2009. ^ Bull, Andy (27 May 2009). "Mongoose mayhem beastly for bowlers". London: guardian.co.uk. Retrieved 17 September 2009. ^ "Hayden launches Mongoose bat". Zee News. Retrieved 26 October 2013. ^ "Taking the long handle: could this bat really revolutionise cricket?". smh.com.au. 29 May 2009. Retrieved 20 March 2010. ^ "Caring for your Bat". Gunn & Moore. 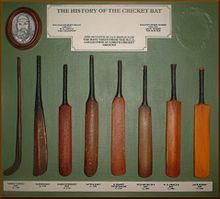 ^ "Cricket Bats". Sgcricket.com. Archived from the original on 12 July 2012. Retrieved 9 July 2012.